I was a bit shocked to look at the calendar today and realise that it is already February, and then I realised something even more disheartening – that I hadn’t blogged about my NaNoWriMo experiences! So, in a completely untimely and probably irrelevant fashion, here it is – the NaNoWriMo post. National Novel Writing Month is a fun, seat-of-your-pants approach to novel writing. Participants begin writing on November 1. The goal is to write a 50,000 word, (approximately 175 page) novel by 11:59:59, November 30. Valuing enthusiasm and perseverance over painstaking craft, NaNoWriMo is a novel-writing program for everyone who has thought fleetingly about writing a novel but has been scared away by the time and effort involved. Because of the limited writing window, the ONLY thing that matters in NaNoWriMo is output. It’s all about quantity, not quality. This approach forces you to lower your expectations, take risks, and write on the fly. I’ve always found the idea intriguing, and had completing NaNoWriMo down as a goal of mine. I knew a lot of people who had attempted it, with varying degrees of success, and I decided that 2011 was the year that I would stop thinking, and start doing. In the months leading up to November there was much discussion about NaNoWriMo, people listing their goals and stating their intentions, blog posts listing the pros or the cons, or both, of the whole enterprise. It certainly seemed to be a fairly polarising issue, with some people effusive in their praise, and others damning in their indictments. One of the most interesting “anti” NaNo posts was from Alan Baxter, who I thought made some pretty valid points, and certainly gave me something to think about. On the other hand, with a writer I respect as much as Tansy Rayner Roberts in the “pro” camp it was hard to write it off. And that was the problem, so many writers I admire on either side. Obviously I would have to do the hard thing and make my own decision!! Thanks to Elizabeth Markham and WriMoFoFo, I have a handy little spreadsheet which I use to set word count goals and track words written, It tells me how I am going and what I need to write per day to meet my goal for the month. Wanting to play fair I ran two spreadsheets, one for NaNo and one for general writing, as their were two anthologies I wanted to submit to. Then I realised that I had all my uni assignments falling due in November and after my surgery the month before I was well behind with them. At this point I started freaking out a little bit. It didn’t help that I started out a bit slow. Before starting I would have considered 1667 words a good writing day, but now it was the bare minimum I had to write just to break even, and every time I didn’t meet that the required daily word count would go up! There was a morbid fascination in watching those figures creep ever larger, like watching a car crash. I could see that it was going to get unsustainable before too long so I made a concerted effort to string together a few really good days, meaning that I always had a bit of credit in the bank for those days where I struggled. One of the challenges was the fact that you had to work on the same project for it to count. In other months, if I got a bit of a block on a piece I would switch to something else and keep writing and those words would all count against the daily target. That made a 2000 word day much less intimidating. But with NaNo I didn’t have that luxury and at times I had no idea where the next sentence was coming from. As the month drew to a close I became increasingly grateful for those earlier bumper days. I have to admit to cheating slightly. I do a lot of my writing at night and I often stay up until the early hours. So, anything written at 1am would count for the day before. As you can see, in the end I finished with a day to spare, and managed to finish all my uni word (with all but one getting a HD, the other a D) and submit two stories, one of which has been sold. I also wrote a non fiction piece which has since published, and that I consider one of my best efforts. While I was pleased with my productivity, I won’t pretend that it wasn’t a struggle. I really did find it tough to sit down day after day and churn out so many words. My sleep suffered, I am sure my work suffered, and I am very fortunate that my wife was so tolerant of how much time I spent locked in my study. I don’t know how many nights I was up until 2-3am, pushing through to that elusive goal. Saying all that, the question has to be asked – was it worth it? Definitely. Aside from the satisfaction of “winning” NaNoWriMO, it made me look at some of my processes and made me believe in my ability a lot more. Now that I know I can produce such volume I am not intimidated by lesser projects half as much. But, I wouldn’t want to do it more than once a year! And what of the actual novel? Was it worth it? Again, I have to say yes. The plot outline I had worked out translated pretty well into novel form and I can see that it is worth persevering. Sure, it needs some revising and editing, but the fact remains that the bulk of it is there, instead of in my head like it had been for the fast few years. NaNoWriMo was the kick in the pants I needed to take the next step. While I think that it really depends on the individual, because everyone works differently and has different strengths and weaknesses, there are a few tips I would offer to people looking at doing NaNoWriMo. Take advantage of the days where the words flow and exceed your targets. For every day of abundance there will be one, or more, that is lean. Prioritise. There were social events I had to say no to during November, but that’s the price you pay. You do everything, so if NaNoWriMo is something you want to do, other things may have to take a back seat. While I understand that NaNOWriMo isn’t for everyone, I am glad I ended up deciding to give it a go. And, despite the hard work, I may even do it this year too! 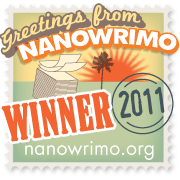 This entry was posted in Writing and tagged NaNoWriMo, writing on February 3, 2012 by David. And the whole ‘it’s not for everyone’ is true. I also read Alan’s post, and I agreed with his reasons as it applies to me. But I’ve also spoken to you and understand why it works for you. Congratulations on completing it. NaNoWriMo is no different, it is beneficial for some people and not for others. It isn’t the holy grail, but nor will it destroy writing as we know it.